Together, the brands selected 18 students out of 1,400 applicants with skill sets across design, engineering and business to compete in six teams and create a new silhouette for the ASICS GEL-Lyte III sneaker. The three-week design course, which took place in July 2015, featured an intense competition built upon Foot Locker's commitment to delivering the freshest, athletic-inspired footwear and PENSOLE's “learn by doing” footwear design process. The winning team created a compelling custom design for the iconic ASICS GEL-Lyte III sneaker. "Through our partnership with PENSOLE, we are committed to fostering innovation and creativity in the next generation of footwear designers and we are thrilled to debut our first winning ASICS design,” said Andy Gray, vice president and general manager of Foot Locker U.S. "Offering this special, limited-edition ASICS GEL-Lyte III design created by a team of fashion-forward thinkers truly demonstrates the core of everything Foot Locker stands for: delivering the freshest and most innovative products to our customers." The competition winners, chosen by ASICS product and marketing teams and the founder of PENSOLE, D'Wayne Edwards, earned a $12,000 prize and will see their breakthrough sneaker design come to life, from conception to production and ultimately to Foot Locker shelves. 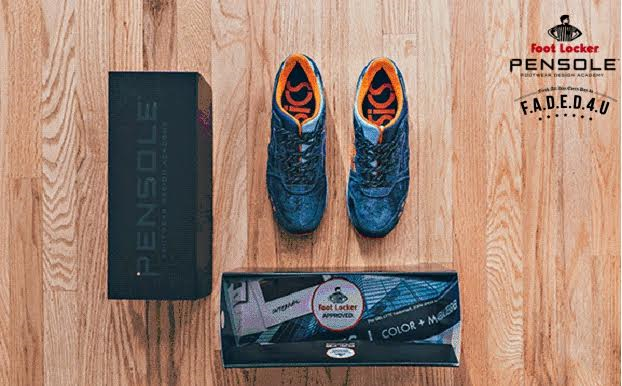 "The future of the footwear industry is reliant upon the type of creativity, innovation and originality displayed by this competition’s winning team,” said PENSOLE founder D'Wayne Edwards. “At PENSOLE, we are committed to providing hands-on learning and training to tomorrow's design and business leaders. Our partnership with Foot Locker makes it possible for students to hone their craft, prepare themselves for their professional careers and see their vision become a reality." The new ASICS GEL-Lyte III design, aptly named “PENSOLE Reflect,” centers around the concept of reflection and mirror images. The design brings to life the variation between night and day, sporting bold blue overlays contrasted by bright orange accents. Further, playing off of a mirror, the right medial side reflects the ASICS logo from the left medial side. The casual shoe blends classic construction with contemporary design for optimal functionality and style. "Transforming the winning design into a finished product for retail has been an amazing journey and ASICS is thrilled to be the first brand to partner with PENSOLE and Foot Locker in this way," said Roeya Vaughan, vice president of marketing for ASICS America. "We could not be more excited about helping to launch the inaugural season and to support the future of footwear." Foot Locker is part of Foot Locker, Inc., a specialty athletic retailer that operates more than 3,400 stores in 23 countries in North America, Europe, Australia, and New Zealand. Through its Foot Locker, Footaction, Lady Foot Locker, Kids Foot Locker, Champs Sports, SIX:02, Runners Point, and Sidestep retail stores, as well as its direct-to-customer channels, including footlocker.com, Eastbay.com and SIX02.com, the Company is a leading provider of athletic footwear and apparel. PENSOLE’s “learn by doing” curriculum teaches students the entire footwear design process: inspiration, concept-development, design process, problem solving, materials, business, networking, marketing, and branding. PENSOLE features the most sought after faculty in footwear, comprised of both young professional designers and established footwear design leaders from the top footwear brands, with more than 100 years combined experience to help you with your professional development. D’Wayne Edwards, a celebrated member of the global footwear community for the last 27 years, founded PENSOLE to give talented young design students—regardless of socioeconomic background—an opportunity to learn from the industry’s best, without financial barriers, and to provide the industry with a farm system for the next generation of footwear designers. Anima Sana In Corpore Sano, meaning "A Sound Mind in a Sound Body," is an old Latin phrase from which ASICS is derived and the fundamental platform on which the brand still stands. The company was founded more than 60 years ago by Kihachiro Onitsuka and is now a leading designer and manufacturer of performance athletic footwear, apparel and accessories. For more information, visit www.asics.com. Follow ASICS America on Facebook, Twitter and Instagram for exclusive content and real-time news about ASICS products, events and elite athletes.